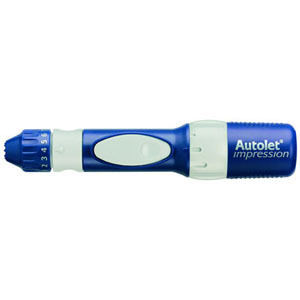 Autolet Impression® is an advanced lancing device designed to provide maximum comfort and control when obtaining a blood sample, encouraging regular glucose testing. Advanced lancing device combines advanced technology and unique features in one capillary blood sampling device. Provide users with ultimate control and comfort. Small pen-style device features seven depth settings for taking blood samples from fingertips or alternate sites. Autolet Impression can be used with virtually any lancet. Unique Comfort Zone Technology® masks the sensation of pain and increases comfort when lancing. Force adjustment that allows users to control the lancet force when sampling. Can be used as an alternative to increasing the penetration depth. 7 penetration depth settings (3) to promote user control and preference. Optional clear alternate site end cap that allows the device to be used for testing on alternate sites such as the forearm for painless testing.